Lake Toba Supervolcano awakens, hot steam, smelling like gas, ceramic floors houses feel hot! Lake Toba Supervolcano is the largest volcanic lake in the world. In addition, it is the site of a super volcanic eruption that occurred about 74,000 years ago, that caused a massive climate-changing event and killing most humans then alive and creating a population bottleneck in Central Eastern Africa and India that affected the genetic inheritance of all humans today. This eruption is believed to have been the largest anywhere on Earth in the last 25 million years. It seems the supervolcano awakens again. Villagers of Sitoluama, District Laguboti, Toba Samosir, North Sumatra in Indonesie are baffled as ceramic floors in their houses suddenly feel hot and besides their houses hot steam and smelling like gas coming out of the ground and it has not stopped yet. Suspected hazardous vapors appear on Wednesday (27/5), exactly in the yard beside the house Purasa, located about ten kilometers from Balige, Toba Samosir regency capital. “Hot steam and smelling like gas coming out of the pores of the soil it is feared to threaten the safety of people around, so we report them to the government,” told one resident, Purasa Silalahi in Sitoluama, Saturday (30/5) to the Indonesian news site Merdeka. Indeed, continued Purasa, since the last three weeks the temperature around our house is very hot, both day and night and the ceramic floor in our house feels hot. Head of the Environment Agency Toba Samosir, Parulian Siregar said he receive continuing reports of citizens who discover the disturbing hot steam around their houses. Meanwhile, scientists, officials and residents are baffled. They don’t know where the steam comes from and if it is hazardous or not (translated). 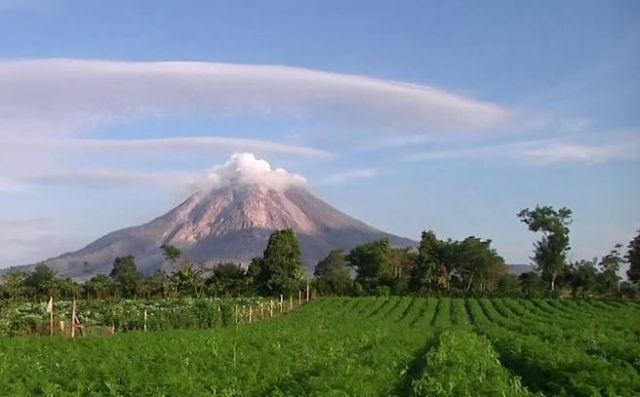 As of June 6th 2015 Mount Sinabung a stratovolcano located just only 25 miles from the Lake Toba supervolcano is erupting yet again prompting the Indonesian government to begin evacuating thousands of people while scientists expect that a massive eruption is imminent. (Image right). I’m not a scientist, but the fact that the Sinabung volcano is just located 25 miles from lake Toba supervolcano and the ongoing volcanic activity in the area, I can imagine that the magma chamber that sits beneath the Sinabung volcano is much larger than scientists think it is. Maybe so large that this chamber stretches as far as to the lake Toba supervolcano and eventually connected to a second chamber that sits beneath the Toba volcano? Could it be possible? Taking into account the super volcanic eruption that occurred about 74,000 years ago, we may wonder whether lake Toba supervolcano will erupt again. 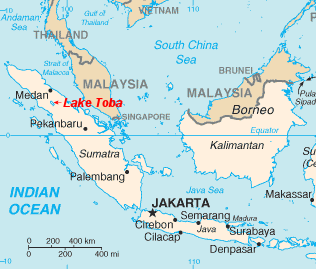 Lake Toba (Indonesian: Danau Toba) is a lake and super volcano, 100 kilometers long and 30 kilometers wide, and 505 meters (1,666 ft) at its deepest point. Located in the middle of the northern part of the Indonesian island of Sumatra with a surface elevation of about 900 meters (2,953 ft). To give an idea of its magnitude, consider that although the eruption that occurred about 74,000 years ago and took place in Indonesia, it deposited an ash layer approximately 15 centimeters thick over the entire Indian subcontinent; at one site in central India, the Toba ash layer today is up to 6 meters thick and parts of Malaysia were covered with 9 m of ash fall. In addition it has been calculated that 1010 metric tons of sulphuric acid was ejected into the atmosphere by the event, causing acid rain fallout. The Toba caldera is the only super volcano in existence that can be described as Yellowstone’s “bigger” sister. With 2,800 km3 of ejecta, it was an even greater eruption than the super eruption (2,500 km3) of 2.1 million years ago that created the Island Park Caldera in Idaho, USA. The eruption was also about three times the size of the latest Yellowstone eruption of Lava Creek 630,000 years ago. 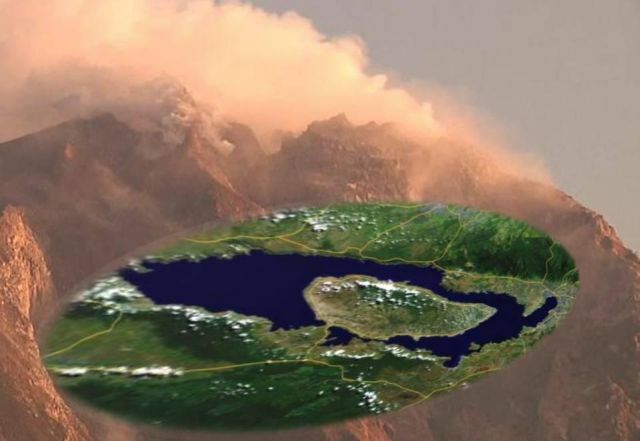 Huge Magma Reservoir Discovered – Is Yellowstone Super Volcano Overdue For Eruption? August 2015: Extreme Weather, Planetary Upheaval, Meteor Fireballs! Volcanic Expert: Super Eruption Coming Soon! Ongoing volcanic eruptions across the globe! Expert claims: This 200 year old mummy is not dead, but in meditation! Egyptian Akahenaten Discovery Changes History Forever! Rare Black Moon event on Sep. 30 / Why Does Bible say about ‘End of Days’ and Second Coming?